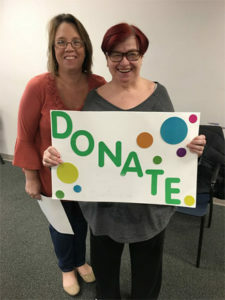 Since its inception in 1971, WCDC has served as a lifeline for adults with developmental disabilities – a bridge to friendship, work and independence. Our educational, social, vocational, and residential programs are designed to encourage self-reliance, achievement, and economic independence. Services are based on an individual directed approach. Each program participant, with assistance from their team, chooses the services and supports they receive. The Worcester County Developmental Center is committed to empowering adults with developmental and physical disabilities to be productive, responsible, and participating members of the community by identifying, enhancing, and creating opportunities so all individuals can achieve their highest level of economic and social independence. The principles identified in our vision are independence, productivity, and integration and inclusion. All projects and activities of the WCDC programs shall be carried out in a manner consistent with these core principles. INDEPENDENCE – Individuals with developmental disabilities and their families are the primary decision-makers regarding their rights and their lives, including services and supports they may receive. They have decision-making roles in policies and programs that affect their lives. PRODUCTIVITY– Individuals with developmental disabilities enjoy the opportunity to work, to contribute to society, and to pursue meaningful and productive lives. INTEGRATION/INCLUSION – Individuals with developmental disabilities have access to opportunities and the necessary support to be included in community life, have interdependent relationships, live in homes and communities, and make contributions to their families and community. Q: What types of service does the center provide? Q: Is the Worcester County Developmental Center ever audited? A: Yes, an independent audit is conducted annually. In addition, state auditors periodically examine financial records. Q: Who manages the Worcester County Developmental Center? A: A Board of Directors ultimately governs the Worcester County Developmental Center, Inc., comprised of individuals from the local community. Q: What is the geographic area that the Worcester County Developmental Center serves? A: The Center focuses its services primarily on the Worcester County area while also accommodating attendees from surrounding counties. Q: Does the center provide transportation? A: The Center provides Transportation covering all of Worcester County and shuttle service from Salisbury, leaving and returning to Holly Center. All vehicles arrive at the Day Program facility at 8:45am and leave in the afternoon at 2:45pm. WCDC is seeking volunteers who are enthusiastic and passionate about making a difference in the lives of individuals with disabilities. If you are interested in serving on either board, contact Jack Ferry, Executive Director, at (410) 632-2382, extension 117 or via email at ferry@wcdcservices.org for more information. The Board governs the organization and has specific fiduciary responsibilities for which it must be accountable. These responsibilities generally include oversight of policy, budgeting, planning, fundraising, human resources, program evaluation and board development for the nonprofit. Board Members should be committed to the fundraising process and participate.